While every school might have different expectations of the midday meals team, such expectations are invariably high. John Viner makes the case for recognising their valuable input. In the grand scheme of things, a school’s midday meals supervisor (MMS) is often its unsung hero. Yet the fact that, while we who work in schools appreciate their importance and the responsibilities they bear, to many of the public they remain ‘dinner ladies’. Sadly, this will not do any longer - to the vaping fraternity, ‘dinner lady’ is a popular range of e-liquids! The longer we allow the old sobriquet to remain, the less honour and respect an increasingly worldly-wise pupil population will show. A quick review of school advertisements reveals that the midday meals supervisor is called variously the lunchtime supervisor, lunchtime assistant or midday assistant. Confusingly – in at least one case – a school has advertised for a ‘school meals supervisory assistant supervisor’, which, presumably tries to explain that it is to supervise the supervisors but leaves the reader wondering if it is an assistant to the supervisor or a supervisor of the supervisory assistants that is required! Perhaps this inability to pin down the role reflects a confusion with it. The SBM, who is likely to be responsible for drafting advertisements and job descriptions needs themselves to be clear about the expectations of an appointment. This is especially true in those many schools where, whatever additional line management is inserted, it is the SBM who holds the final responsibility. how to ‘display the approved sign in the correct manner’. However, although she had basic first-aid training, I don’t recall her having much training in supervising children. Instead this was sort of on-the-job stuff, led by our vast teaching staff of headteacher plus 1.2 assistants. All that was, as I said, a long time ago and the landscape has changed considerably. Jump forward a quarter of a century to when I was responsible for a 3FE coastal primary school and nursery. We had a large team of midday supervisors, both male and female, some of whom also worked as teaching assistants. By then, there were high expectations of the training which we were bound to provide and high expectations of the MMS team in discharging their duties. Indeed, because of the extremely challenging nature of the school, all our meals staff were also trained in physical restraint. However, what was obvious then – and is obvious now in work that I do with schools – is that we are expecting these folk to turn up for a couple of hours in the middle of each day for what is often the national living wage (Currently £7.83 for over 25s). A recent survey suggests that the average MMS wage is £8.25 per hour. Let’s consider what we can expect for around seventy quid a week. This is, of course, central to the role. 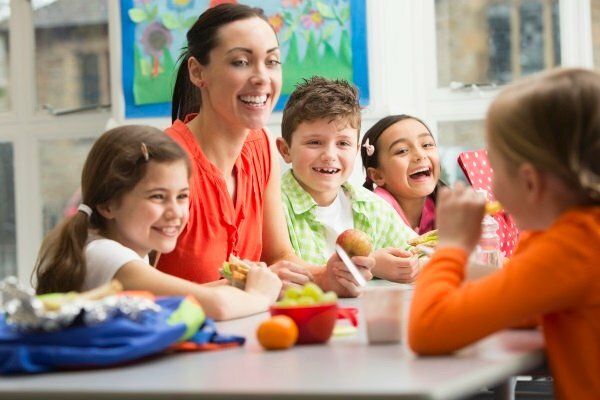 Depending on the age of the pupils, the MMS may need to help them make food choices – so knowledge of healthy eating is helpful – cut their food up and ensure that social groups are managed. So many pupils do not know the ‘correct’ (i.e. social norms) use of cutlery so the MMS may need to teach, demonstrate and reinforce. What are your school expectations of mealtimes? Do pupils sit in years, friendship groups, hot meals versus packed lunches? Do lunchtimes support or erode social interaction? Make your expectations clear to your lunchtime team and check they are being met. Like many senior colleagues, I have spent quite a lot of time getting MMS to properly supervise and not stand in groups chatting. However, these days are largely gone and colleagues understand that they are responsible for the safe operation of their own playground zone. They understand the school’s behaviour policy and apply it. Check your playground to identify the ‘hotspots’. Are there any points where pupils say they feel unsafe? If you have not done so, consider zoning the playground and training lunchtime staff to know their zone and manage it well. Extensive playing fields mean that a school needs to deploy its lunchtime team carefully – it’s a bigger area but the same number of staff. In my coastal school I was blessed with supervisors who could referee football games as well as help pupils to plan their own games. Have you thought about how supervision on the field has to be different from the playground? Go to almost any school and you will find that some or all of the MMS team are carrying small first aid bags. But are they trained regularly and do they practice? I once had a three-ambulance day! I say this not to impress but to make the point that, with 600 pupils charging around a school field, even with well-trained and proactive supervisors, accidents can still happen. How recently were your lunchtime team trained in first aid? And do they have a chance to refresh their skills? After all, these colleagues are more likely to handle injuries than any other staff. This is, or should be, a given. Yet, recently working with a challenging school, I was somewhat surprised to find that behaviour training among the lunchtime staff had been quite minimal. Do involve your midday team in behaviour management training, especially since pupils’ responses to them are not likely to be as respectful as to classroom staff. Midday supervisors play a key role in the school’s behaviour and heath and safety systems. Do you have a good feed-forward system that allows them to share concerns with classroom staff? Lunchtime supervisors have a range of duties and responsibilities, varying according to the type and character of school. The least we can do is to ensure that they are equipped for the role and feel part of the team, not separate from it.